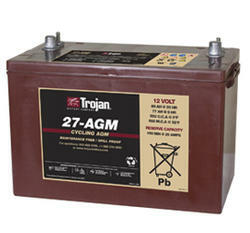 Trojan Group 27AGM 12 Volt Battery Free Delivery most locations in the lower 48*. Length 12.7" Width 6.9" Height 8.75"
USA Battery Sales offers Trojan Batteries with free shipping to most locations in the lower 48*. *Call 888-737-5681or Email us with your location before ordering to see if you qualify for our free shipping offer.